Oh, bread! I remember back in the day, which was on a Wednesday by the way, getting my first bread machine. Man that was fun… we made all sorts of experiments while getting fat in the process from all the carbs. 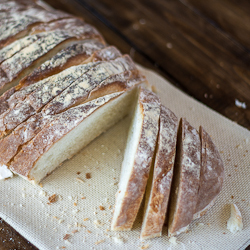 [heh] Still, there is nothing like the smell of the fresh baked bread… so I decided to share with everybody the simplest bread recipe that thankfully, doesn’t require a bread machine… nor kneading. [^^]. This is very simple. In a medium bowl some the lukewarm water, it has to be a bit warmer than body temperature, add the salt and the yeast and stir together. In the bowl of your mixer add all the flour and then pour the yeast mixture over the flour. Using the dough hook mix it all together. The dough will be sticky so don’t be tempted to add more flour. Now you can place the dough in a big plastic container with a lid, but do not close the lid completely, leave one corner open a bit. Or you can just place it in a big bowl and wrap it up really well with plastic wrap and poke a couple small holes with a toothpick so that the gas released can escape a little. Let it rise in a warm place for a good two hours. Now as I said there is no kneading necessary, so all you have to do is shape your bread, but because the dough is really sticky you need to put lots of flour on your hands. Basically you have to divide the dough in two and shape each piece. It is ideal to bake this bread on a stone, but if you do not have one you can just use a regular baking sheet covered with parchment paper. Place it seam down on the baking thing, sprinkle some more flour on top, then let it rest for another 30 minutes so that it rises a bit more. Preheat the oven to 450° F / 232° C. Before placing the bread in, slash it’s top with a knife, it will make it look pretty, plus it will allow for the trapped gases to escape. Now there’s a trick! Place a pan with a cup of water in the oven and slide it on the bottom rack and the bread on the middle rack. As the water heats up in the oven, it will create steam which will give the bread that nice crusty top. Bake the bread for 30 to 35 minutes and let it cool completely before cutting into it (or just rip a piece off while it’s hot, for crying out loud). In a medium bowl add the warm water, salt and yeast and stir together. In the bowl of your mixer add all the flour, then pour the yeast mixture over and mix using the dough hook, until it’s all well incorporated. Place the dough in a large plastic container, it needs room to rise, and put the lid on it, but do not close completely, there needs to be one corner left open to let the gas escape. Alternatively, you can use a large bowl, covered well with plastic wrap and poke a couple small holes in it's top using toothpicks. The dough will be very sticky and elastic. It is recommended to bake this on a stone, however a regular baking sheet will work just fine. Cover the baking sheet, or stone with parchment paper. Put some flour on your hands, and divide the dough in two pieces. Shape the dough into the desired form for your bread and place it seam down on the baking sheet. Sprinkle some more flour on top of the loaves and let them rest for another 30 minutes so that they can rise a bit. Preheat oven to 450° F / 232° C. Before placing the bread in the oven, add a pan with a cup of water and put it on the bottom rack. Slash the top of your bread, to allow gases to escape. Bake it for 30 to 35 minutes. The water will allow for the bread to form a nice crusty top. How does the yeast act when added to the salt water? Wouldn’t the addition of salt to the water part kill some of the yeast before it’s even in the bread? can the artisan bread be made with whole wheat flour or a blend of part white part wheat? I never tried that but I don’t see why not. Is it ok to use inox bowl instead of plastic?